This will be a review of KoinMe a brand new website that pays you to passively play videos on your computer. Currently, KoinMe is giving a 500 Bonus which translates to $5.00. This bonus may go away anytime so get it while you can. Currently, KoinMe is only for Windows, Linux, MacOS. However their site states they will have mobile support coming soon. We have done reviews of sites similar to this one namely Earnhoney. However, KoinMe has one huge advantage over sites like Earnhoney at the moment. This is because KoinMe does not have to be in the focus or require any direct any input. What this means is you can minimize the KoinMe tab that is playing the videos and still earn points! So you can check your Facebook, Twitter, News, YouTube, etc and still make money. Not to mention this also means you can put Earnhoney in the focus in and KoinMe in the background and earn with both! KoinME is not a scam. I know it may seem odd for a company to be willing to pay you to watch videos right? How sites like KoinMe work is that have a relationship with advertisers often times have a hard time getting their products recognition. Sites like KoinMe step in to help these advertisers connect with individuals they would never be able to otherwise. 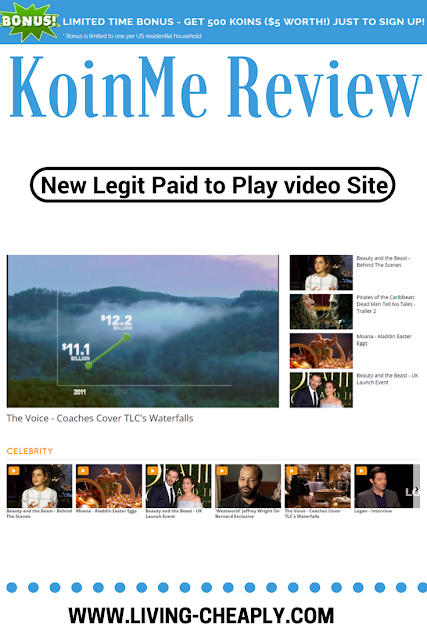 When ever users of the KoinMe site plays a video they get paid by these advertisers. They then of course have no problem paying thier users a cut of the profit. Click HERE to head over to the KoinMe sign page. Create your username and password and log-in. You will always stay logged in after your this. Simply enter your Username, Email, Password, and Referral Code. You will have to confirm your email before you can login. So please use a valid email. All Done! Now your ready to passively watch videos on KoinMe until you have 1000 points and cash out to your choice of Gift Card. After your first redemption you can redeem a gift card when you hit 500 points. I think this is due to the 500 points sign up bonus going on now. KoinMe has a 100 point per day cap that translates to $1.00 per day. Their limit resets at 12 Midnight is night. I am usually up at this time so I just start my play list and let it go. Usually when I wake up in the morning I will have made me cap for the day. All you will do to earn money on KoinMe is click on the offer tab. Next click on one of the videos. All Done! You should now see your video playing. While your video is playing you will see a timer and steps popup. You will need to make sure you allow popups on this tab or you will not get credit for the videos. This will only have to be done the first time you play a video. After that you will simply just have to click on the video and let it make money for you while your doing what ever you like. If your computer is being over worked by this site their is a change your videos may stop playing. In this case you may need to check your KoinMe tab from time to time to make sure its still playing. Otherwise the videos should play until you hit your cap of 100 points. KoinMe rewards you either 1 or 2 points for each playlist. So you will make $0.01 to $0.02 for list. Maybe the easiest way of earning points on KoinMe is by giving your referring your friends.You will get 10% of their earnings for life, If you do not have a code to use please use ours. It helps us continue to be able to make reviews like this one. Click HERE to use Living Cheaply's Referral. Thanks to everyone who supports us and reads our posts. KoinMe dos a excellent job of letting users know what they can and can not do. They even have a rule tab. KoinMe is a legit new passive video alternative to Earnhoney. Although you can actually use both at the same time. I have their found videos run best on google chrome with few crashes. The computer I run the videos is a bit slow so I will check my computer refresh it every couple of hours if I am awake. But most of the time the site runs super smooth. Living Cheaply would love to hear about your experience with KoinMe in the comments below.